The only things required are a map, a backpack crammed with kit and food (and maybe some wine, if space allows) and a vague sense of which direction to start off in. With those essentials, the world is your oyster. Or the Brecon Beacons are, at least. The signs were promising as we hauled on our packs outside the Black Sheep Backpackers opposite Abergavenny station. Our hosts had provided a comfy bed and self-service breakfast for a very reasonable £16 a head, and the sun was warming the spring air as we ambled through the town. After picking up some last-minute essentials (jelly babies, wine gums and another bottle of red), we studied the map to establish the beginnings of a route. The star attraction near Abergavenny is Sugar Loaf, which attracts thousands of walkers each year. That could be saved for the way back; we opted instead for its outlier, Deri. This provided an easy start to the day and from its northern end we could see the fingers of the Black Mountains’ ridges reaching towards us. Decision time… which one to aim for? One advantage of running your own walking website is that you get to read about other people’s favourite walks. I recalled a route submitted a few years’ previously in the Vale of Ewyas, called the Half Moon loop and written up in loving detail by its author. This memory was enough to swing the vote; we finished off the jelly babies and veered northeast. There can be few more rewarding walking experiences than the Brecon Beacons on a warm, clear day. It’s not the most dramatic landscape in the UK, nor do its hills provide many demanding challenges. But as we passed through its farms and fields, pausing for a two-hour lunch in a sun-kissed woodland clearing, it felt like a good choice for a weekend’s walking. 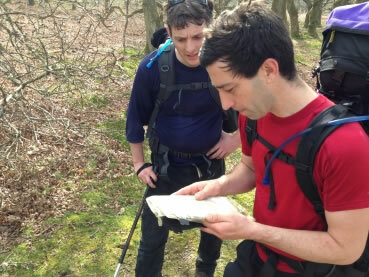 We dropped in and out of several valleys before reaching our target, Hatterrall Hill. Buzzards circled overhead as we began the climb up the hill, pausing regularly to admire the Vale of Ewyas stretching out beneath us. Beyond the highest upland farm in the well-groomed Cwm Iau, we reached the rougher open access land. The buzzards gave way to the urgent Morse code peeps of skylarks trying to distract us from their nests. The Offa’s Dyke path lay invitingly ahead along the high ground, but the shadows were lengthening. It was time to find a place to camp. 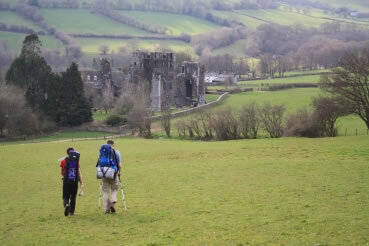 Passing quickly through Llanthony, we continued across the valley and up onto Bal Mawr. Amid the old mine workings on the top, we found the perfect spot to pitch: a soft heather mattress, a slight dip providing shelter from what little wind there was, and several flat stones on which to stand the gas stove. 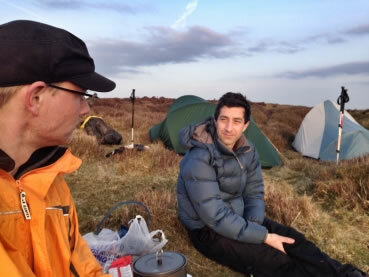 Soon the pasta was boiling, and the hoots of owls carried up from the valley below. We uncorked the wine and sat back in the fresh evening air; the perfect end to an unplanned day in the hills. Words by Tim. Pictures by Patrik. Inspiration by Gary.